SMi are delighted to have, Nagy Habib, Head of HPB Surgery, Imperial College London and Co-Founder, MiNA Therapeutics, as the Keynote Address for day 1 at RNA Therapeutics 2018! Professor Nagy Habib is Head of HPB Surgery at the Hammersmith Campus of Imperial College London and Co-Founder, MiNA Therapeutics. He is also a serial founder and entrepreneur of life sciences ventures. He is co-founder of several biotech companies: EMcision Ltd, OmniCyte Ltd, Apterna Ltd, Medeva Plc and Bioenvision Ltd. Previously he was Pro-Rector for Commercial Affairs at Imperial College London. He is a translational researcher who pioneered the first clinical trial of the use of plasmid and adenovirus for the treatment of liver cancer, as well as the use of plasmid gene therapy in hydrodynamic gene delivery. He was the Principal Investigator of world first clinical trials published on the use of adult bone marrow-derived stem cells for the treatment of patients with liver insufficiency and CD34+ cells for patients with stroke. He was the inventor and co-author on the first publication to describe the use of radio frequency energy in devices for liver surgery (Habib 4X), and interventional endoscopy (Habib™ EndoHPB and Habib™ EUS-RFA). SMi are excited to have interviewed Professor Nagy Habib about his talk and career experience. Q. What will the conference attendees be able to learn from the talk? Q. What are the biggest challenges associated with developing an RNA Therapeutic? A. The biggest challenge is drug delivery. Currently, there are very few successful delivery systems. Only GalNAc can reach exclusively the hepatocytes. All other lipid nanoparticles reach the liver as well as the immune system. Extrahepatic delivery will be an exciting avenue when it happens. The second biggest obstacle is method of administration. 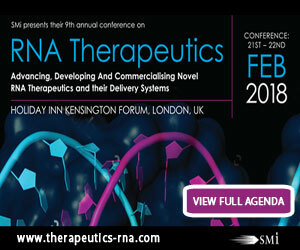 For RNA therapeutics to be highly competitive it has to be delivered in an oral form or by subcutaneous administration. – Harnessing the innate mechanism of gene activation. – Evaluating how saRNA can be used to restore the expression of CCAAT/enhancer binding protein alpha (C/EBP-a). – Achieving proof of concept: Clinical applications and therapeutic opportunities this offers. – Lessons learned during Phase I Clinical Study of MTL-CEBPA in Patients with Liver Cancer. Professor Habib holds a Gold Award from the Advisory Committee for Clinical Excellence which is given to recognise and reward the exceptional contribution of NHS consultants, over and above that normally expected in a job, to the values and goals of the NHS and to patient care, and he was named as one of Britain’s top surgeons in December 2011 by the Saturday Times Magazine. In the 2014 Research Excellence Frame work (REF) exercise, which is the system for assessing the quality of research in UK in higher education institutions, Professor Habib was rated as a 4* researcher which is the highest ranking. His work on radio frequency ablation was selected among those that have had the most “Impact on Society” and was ranked 1 with a score of 93%. In January 2015 he was elected as a Foreign Member by the prestigious French Académie Nationale de Chirurgie. For those looking to attend there is currently a £200 early-bird saving, ending November 30th.